One of the most popular and financially successful movies of all time, Gone with the Wind is a favorite for many film lovers around the world. Even for people like me who hadn't seen it, the title evokes images of war-torn Atlanta and Rhett Butler saying "Frankly my dear, I don't give a damn." Famous lines like that one and "tomorrow is another day" have moved into the popular culture and transcended the movie. This type of epic is the perfect choice for this marathon because it forces me to check out a picture nearly everyone has seen. Was I swept up with emotion by this sweeping melodrama? Let's get to the questions to learn the answer to this and other pressing concerns. 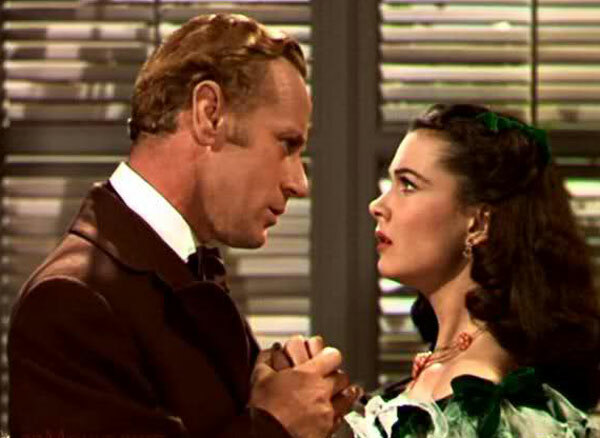 Scarlett O'Hara (Vivian Leigh) thinks her life at the Tara plantation in Georgia is tough because of her unrequited love for Ashley (Leslie Howard), an honorable guy who doesn't share the feelings. She has no idea what's in store. The Civil War begins, and the initial optimism for the South turns to horror when the Union starts destroying their homes. Scarlett is forced to flee Tara with her pregnant friend Melanie (Olivia de Havilland), Ashley's wife. She vows to do whatever it takes to survive, and she gets her chance during the horrors of Reconstruction. Along for the ride is the smooth Rhett Butler (Clark Gable), who has a connection with Scarlett but watches as she gets married twice without love. When Rhett and Scarlett finally decide to get together, the results are as torturous as the evils brought by the Carpetbaggers. A happy ending doesn't seem to be in the cards for anyone, especially the volatile couple. There's a two-fold answer to this question. First of all, Gone with the Wind is nearly four hours long. That's quite a time investment for any movie, especially one that doesn't fall into a must-see genre. This brings me to my second hesitation, which involves my general dislike of melodrama. I don't mind a good romance if the characters are interesting, but watching people suffer a series of tragedies is not my favorite pastime. My interest in the U.S. Civil War did make this film seem more attractive, especially due to its rarely seen Southern perspective on the war. However, sitting down for such an extended period to find out if Scarlett can find true happiness was a tall order. I had seen clips from this movie in the past on television, but it wasn't enough to draw me to a full viewing until this point. This ambitious film includes remarkable shots that remain striking today, especially the final image of Scarlett in front of Tara. Her powerful speech right before the intermission is another remarkable scene that ends the first act in epic fashion. These moments lose none of their positive impact more than 70 years later. Unfortunately, the same praise cannot be given to the depiction of race relations. The African-American characters are portrayed as happy slaves who care for nothing more than serving their masters. 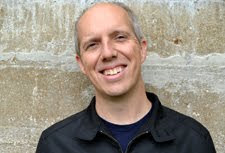 Although Sidney Howard and a team of uncredited writers toned down the racism of the novel, there are still serious issues within the script. 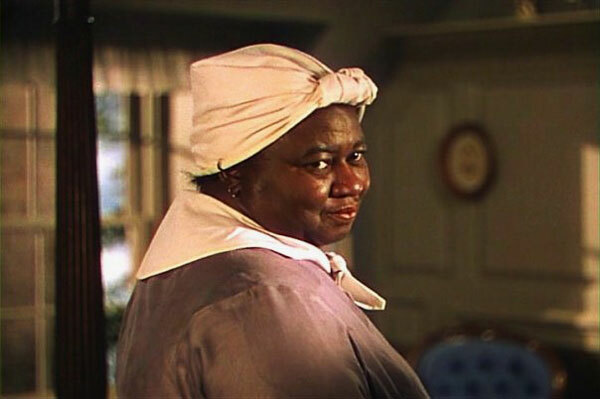 Hattie McDaniel won the first Oscar for an African-American as Mammy, and she deserves the acclaim. Her strong performance makes a thinly written character a lot more than a stereotype, but there's only so much she can do to combat the discrimination on display. The script is even nastier to Butterfly McQueen's Prissy, who spends the movie whining for apparent comic relief. McQueen was a supreme talent forced to play this type of role because it was the only option available at the time. I shouldn't be surprised to see racist attitudes in a 1939 release, but it still makes it tough to consider this one of the great films of all time. 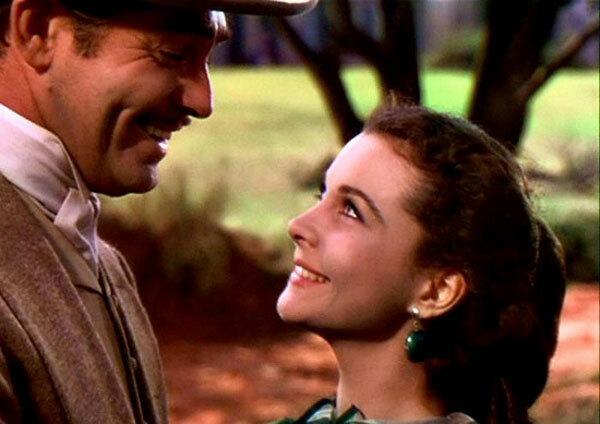 Vivian Leigh does an excellent job as Scarlett O'Hara and carries the movie, which is no easy task. She plays a character that's frequently unlikable yet still understandable with each move. The film's point about Scarlett becoming cold due to the destructive power of Sherman's March is obvious, but Leigh never makes the evolution simple. Clark Gable is his typical charming self in the meaty role of Rhett Butler, who can't help but fall for Scarlett despite her interest in Ashley. Speaking of that noble guy, he's a dull character who's a good man, but it's never clear why Scarlett loves him. Howard is okay but falls way short of Gable's charisma, which makes her obsession seem foolish. Plus, he rejects her to marry his cousin Melanie even though he loves her. Ashley's a strange one. Olivia de Havilland does well as Melanie and makes her likable despite the obstacle she presents for Scarlett. 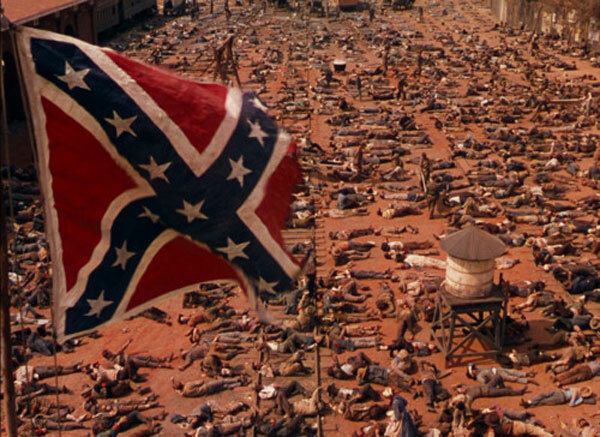 The first half of Gone with the Wind includes expansive shots of the Civil War, particularly the devastating aftermath of the battles. Shots like the one above are made for the big screen but remain powerful when viewed at home. Other moments shoot the characters in silhouette and resemble work by the German expressionists during the early 1920s. This film makes full use of color in a time when black and white was the norm. The problems truly appear during the second half, when the melodrama takes over the story. We learn that Rhett Butler should never open his mouth about any possible tragedy. At two separate points, he makes a crack about a terrible occurrence and then it happens immediately afterwards. The second moment should be horrifying but feels comical because of Butler's wise cracks. The final hour feels interminably long and slows down the pace way too much. The classic ending almost makes it worth the wait, but the series of tragedies feel sudden and become too ridiculous to give them a pass. In one sense, Gone with the Wild meets expectations and delivers an epic story with memorable scenes. Unfortunately, it's also uneven and isn't able to sustain the pace for the entire running time. I'm glad to have finally caught this beloved movie and mostly enjoyed watching it, but there were stretches that fell short. Part of the issue relates to my resistance to the over-the-top melodrama, but that's not the only concern. The story depicts the Southern people as noble souls tormented by the evil, uncaring Northern army. Reconstruction was likely very difficult, but I doubt that everyone who participated was corrupt. We're seeing history from the perspective of the South, so I understand that this film identifies with the main characters. This approach doesn't kill the movie, but it raises warning bells that only increase when combined with the clunky emotions. Regardless, it deserves a look for any movie fan looking to check out film making on a grand scale. Glad you caught up with this one, Dan. I agree with almost all of your points- Leigh's amazing, Howard's incredibly miscast, hard-to-watch racism, etc. The element I'd add is the larger historical scope of the film. Released in 1939, it functions strongly as an allegory to the world situation at the time. Imagine going to see the premiere on the eve of WWII and hearing that memorable first line, "War, war, war- all anyone wants to talk about is war!". The film was a particular success in England, where it played throughout the blitz, and at home, Scarlett's second act struggles were strongly identified with by a people just out of the Great Depression. I find it particularly interesting the generational disconnect, re: Scarlett. Most people I know dislike her, as she's pretty much a straight-up , but people I've talked to of my grandparents' generation (who lived through the Depression and WWII) feel much more fondly towards her. Kate, I hadn't really considered how this film played back in 1939, especially in terms of World War II. Looking at the story from that perspective (with the U.S. hesitant to enter the war), it adds a different layer to it. The point about what was needed to survive during the Great Depression is also something I missed. I'll definitely have to check out that Carol Burnett Show episode in the near future. Thanks! 1939 was a fabulous year for film- perhaps the fodder for a future marathon? To name just a few, GWtW, Wizard of Oz, Stagecoach, Mr. Smith Goes to Washington, Ninotchka, Wuthering Heights, The Women, The Roaring Twenties... Such completely different films. I'm sure they aren't all reactions to the global instability of the time, but they're certainly interesting when viewed through that prism. Kate, you're right that 1939 is one of the best years of film, if not the greatest. Stagecoach is a classic, and Wizard of Oz and Mr. Smith are right there too. I've seen the top movies, but it might be interesting to check out a marathon of 1939's second tier. Good post. I caught up on Gone With the Wind last year, too, and I think I enjoyed it even less than you did. 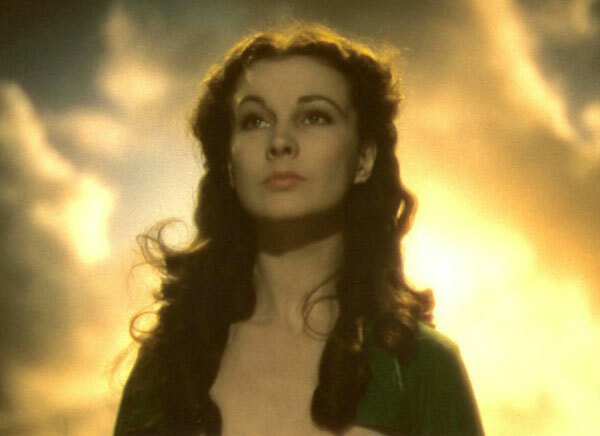 No doubt, Scarlett O'Hara is a great actress, but I didn't like her character at all. Mette, I think Kate's comment above makes some really good points about what the film was about for audiences in 1939 that I missed. It doesn't make it a perfect movie, but it does shed some light on what they were trying to achieve. How could any woman not fall for Leslie Howard? :) For Scarlett, it was especially obsessive, because he was the only man she couldn't have. Great write up Dan! You described the Scarlett character as often unlikeable. I'd describe her as completely unlikeable. Because of this character it lessened the impact of the film for me. Even though I saw this several years ago, I have never had the desire to watch it again. I would second the mention of Went with the Wind. It was very funny. Chip, I can see what you mean. I still think that part of her becoming such a tough character is the situation with the war. She wasn't great to begin with, but the war and difficulties of Reconstruction made her even harder. A) how she's supposed to be unlikeable at first. Leigh unfortunately isn't a strong enough actress to convey her evolution very well, so by the time we reach act two, she's still being a brat when she should be more a more accomplished manipulator. B) Victor Fleming wasn't the film's original director; that was George Cukor. Cukor was always known more for his 'women's pictures' (like My Fair Lady or Dinner at Eight), and Fleming for being his strapping manly work (like Red Dust). The actresses were displeased at the switch from Cukor, and went back to him for help on building their characters which apparently Fleming didn't give a damn about. The movie's remembered for a lot of reasons, not just that it's a grand epic, but that it is, adjusted for inflation, the most popular movie of all time. Like a lot of things, popularity doesn't necessarily configure directly with quality, and while there is greatness in Gone With the Wind, it's definitely a product of its time. Interesting thoughts, Danny. Somehow I missed your comment, so I'm responding way late. I did read about the director switch, and that likely contributes to some of the disparity among certain sections of the movie. Scarlett seems like a grand heroine at times and gets whiny at other moments. Like you say, part of that is due to Leigh's limitations as an actress. Thanks! You've hit on every one of my issues with this movie, most notably the ridiculous representation of antebellum South. 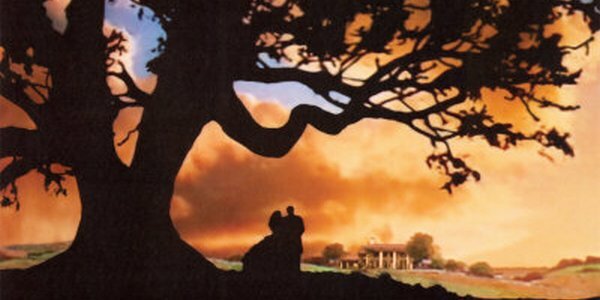 I can't deny its greatness... but I tend to refer to Gone with the Wind as the best movie I'll ever loathe. I like that phrase, John. It's an epic movie that works on a grand scale but falls apart in a lot of simpler ways. The book was wayyy better than the movie. Haven't read the book, so I can't argue either way. There's a good chance you're right, though.